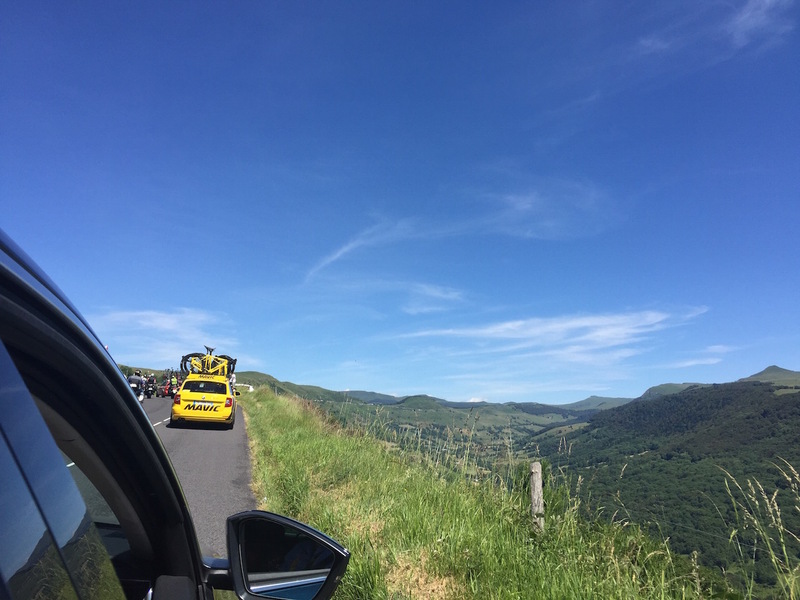 I had a feeling that riding in an official car in Le Tour de France was going to be “sick.” I just didn’t think it would almost make me “sick.” But as Jean Claude, our highly experienced driver who raced in over 10 Tours before becoming a driver, was literally powersliding around steep hairpin curves at about 80 MPH during a very punchy Stage 5 of Le Tour de France, I learned even an experienced sailor who rarely gets seasick can almost get car sick. And my brush with car sickness only came on towards the end of the stage as we raced to the finish line and it was totally worth it! 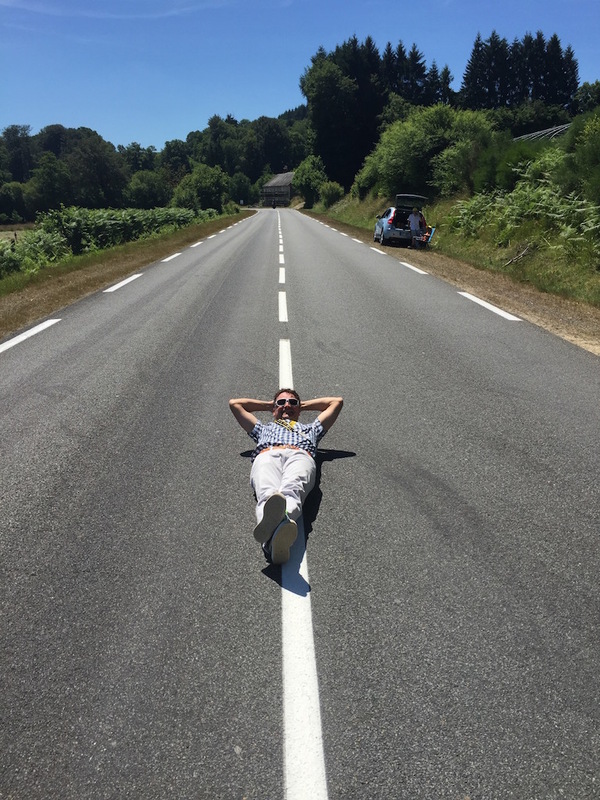 Jean Claude put the hammer down in the straightaways and then screeched around the curves of Stage 5 that went through some of the most remote (and stunningly beautiful) parts of France. 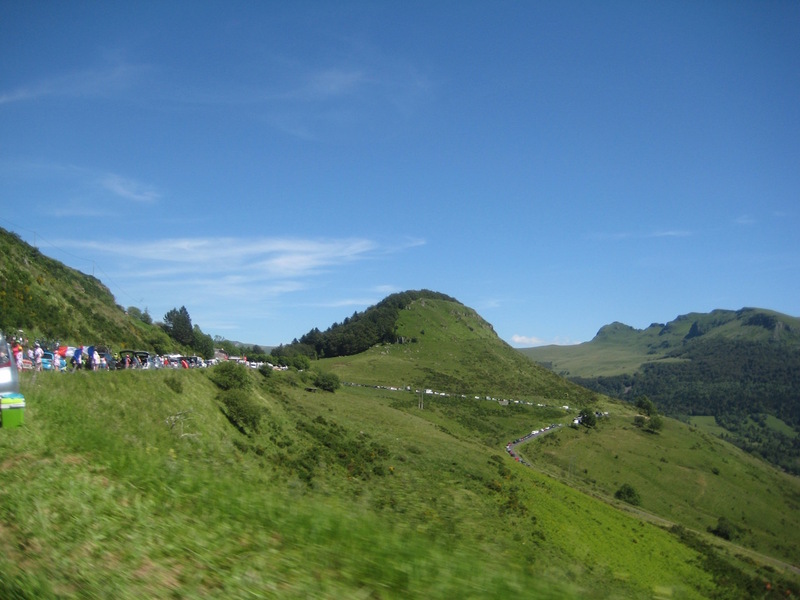 But you can also see the campervan fans were out in full force on the punchy climbs towards the end of the stage. 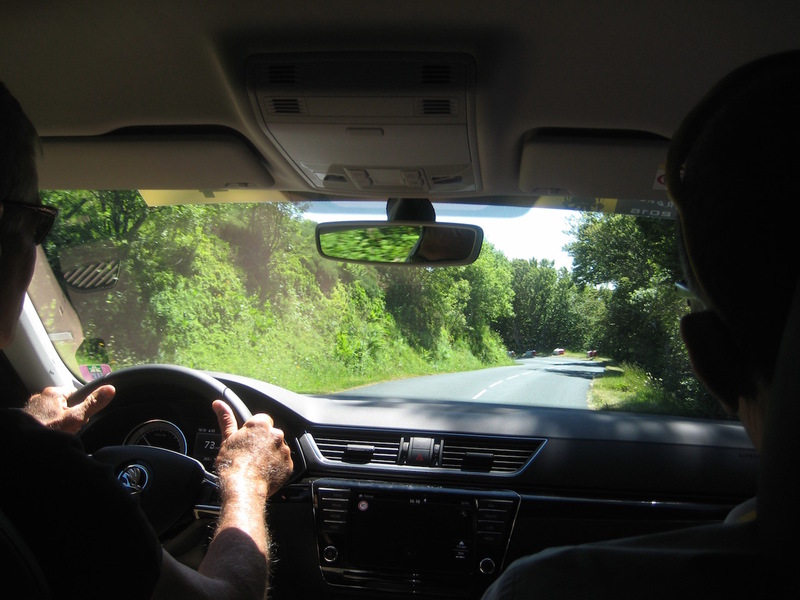 But, in true French fashion, we didn’t see any of this until we’d stopped for a pleasant, little roadside…lunch. This shot was taken shortly before the breakaway shot by at about 25 MPH. And see that car off on the right hand side of the road? Jean Claude showed me just how awesome Le Tour is when he walked down to them and poured and toasted his fellow countryman a plastic flute of champaign. Vive La France! 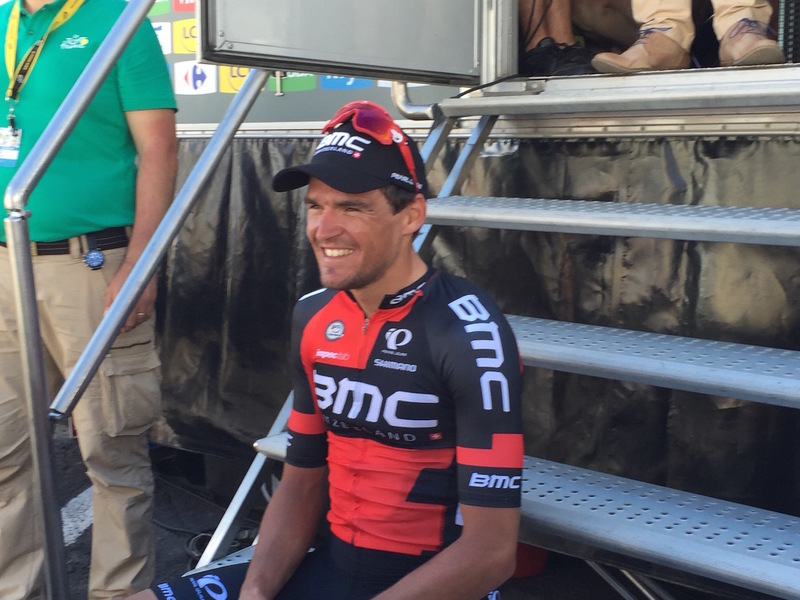 And Jann putting his arm around us and saying “Avec moi” to every security guard made it possible for us to be in the literal “backstage” where the day’s winners (Greg VanAvermaet pictured oh so close below), dignitaries, podium girls, iconic Tour legends hung out. Not to shabby for a day that started on a private jet on the outskirts of Paris. But the coolest thing may have been shortly after the stage finished. I was hanging out waiting for Jann and Jean Claude so we could drive to our next stop—the start town for the Tour Pro Am that we all were riding in the next day—when, the true rock star of the peloton sauntered past with his girlfriend. 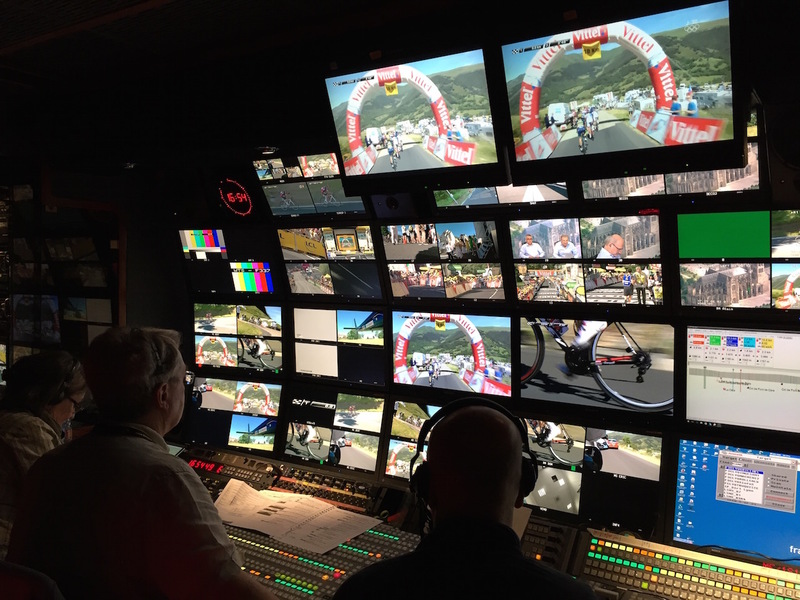 I simply love this picture because it shows how intimate Le Tour is. 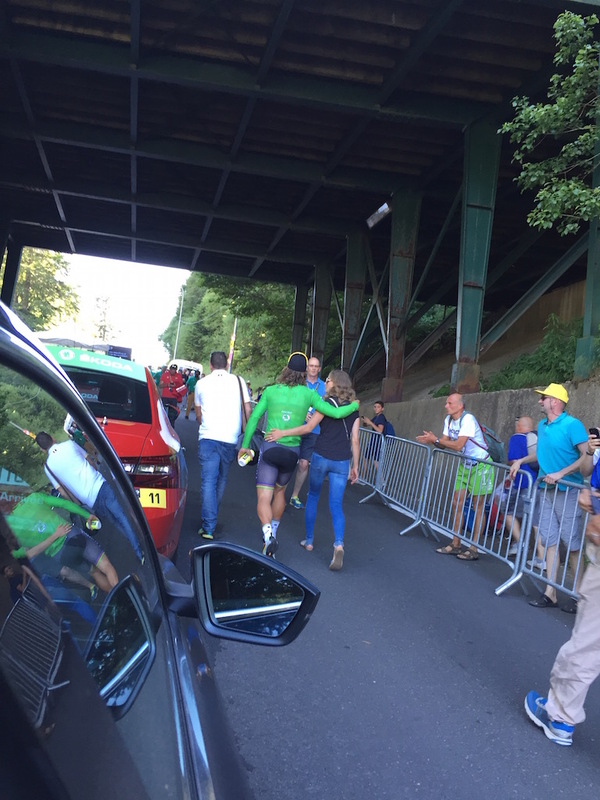 Here’s Peter Sagan walking arm-in-arm with his wonderfully tight-jeans-wearing girlfriend up the hill to his team bus after being awarded his umpteenth green jersey. In fact, he’s still wearing the yellow shades he wore since he stared the day in yellow but had surrendered it to VanAvermaet just moment ago. And it was such a normal sight, I didn’t even think to snap the photo untill they were almost out of range. 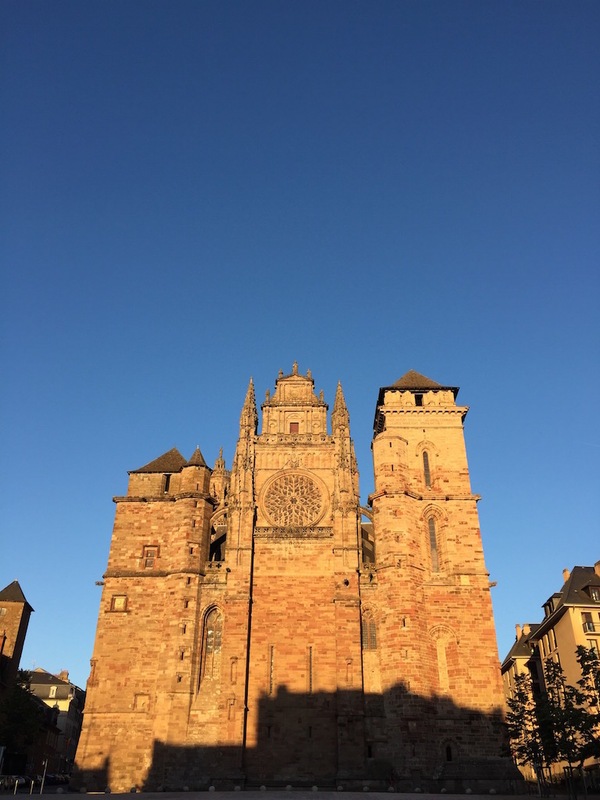 I had no idea at the time, but, we were headed to the cathedral town Rodez…over 2 hours away through the literal center of France…for the start of the Pro Am the next day. And there were lots more mal-de-car inducing hairpin turns to go. Be sure to tune in tomorrow to see if I fully embarrassed myself by throwing up in a offical Tour Le France team car!